One of the luxuries of being retired is that I can do all the late-night reading I want, and I’m continually being amazed by what I read. Remember the shortwave radiomen in those old movies about World War II: “Come in, Rangoon! Come in, Rangoon!”? When I was a kid, the family’s floor-standing radio had shortwave bands, and I recall the fun I had picking up broadcasts from far and wide. But like everything else from that era, shortwave radio faded out — or so I had thought. The London-based Economist reported June 21 that while shortwave radio has pretty much gone off the air in Europe and North America, it’s still widespread in Asia and especially Africa. The BBC World Service, for example, has a worldwide radio audience of 182 million, of which 105 million still listen on shortwave, The Economist reported. In Nigeria, shortwave use is actually growing. 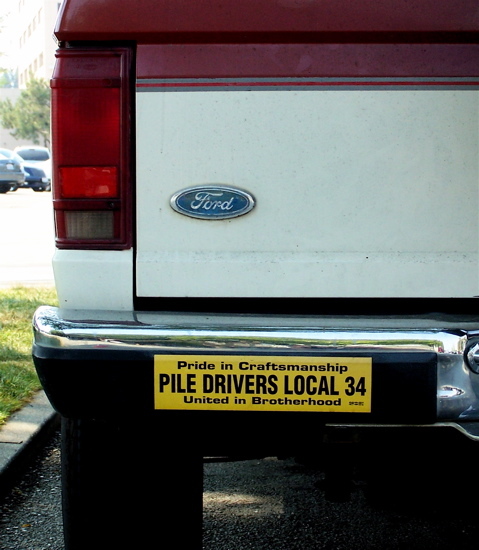 ‘Pride in Craftsmanship‘ photographed in San Rafael. While visiting Rome some years ago, I ended up staying across the street from what appeared to be a one-building country — and it wasn’t the Vatican. A sign on the front said, “Knights of Malta,” and I could see parked cars with Knights of Malta license plates in the building’s courtyard. All that came to mind after the inner council of this order of monks, also known as Sovereign Military Hospitaller Order, elected Friar Matthew Festing, 58, of Great Britain its new grand master to replace Friar Andrew Bertie, who died in February. The “sovereign” Knights of Malta, who do international aid work, have 12,500 members worldwide but no territory of their own, Napoleon having seized the Island of Malta from them in 1798. The order actually began in 1080 AD, took part in the Crusades, and after the Christian defeat ruled first over Rhodes and then over Malta. Not only do the Knights of Malta have their own license plates, I read last week that they issue their own passports, have their own flag (right), stamps, and currency, actually are widely recognized as sovereign, and have diplomatic relations with 99 countries. For two centuries after the loss of Malta to Napoleon, the nation had no country — merely headquarters in downtown Rome — until 1999 when the government of Malta agreed to let the knights repossess historic Fort St. Angelo for 99 years. As a result, the Knights of Malta/ Sovereign Military Hospitaller Order, is probably the only sovereign nation in the world that leases its homeland. 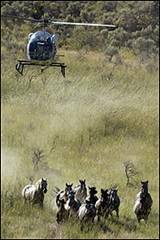 The National Audubon Society, which once romanticized the West’s wild horses, now calls them “feral equids” and wants thousands of them killed, as does the US Bureau of Land Management, The New York Times reported Sunday. The Times noted there are 33,000 wild horses roaming BLM lands from Montana to California, and another 30,000 have been rounded up and are in holding facilities until somebody wants them. From the perspective of a mustang used to the wilds, this is probably like incarceration at Guantanamo Bay. From the perspective of BLM, continuing to spend $26 million a year to take care of all the horses it rounds up (below) is far too expensive. 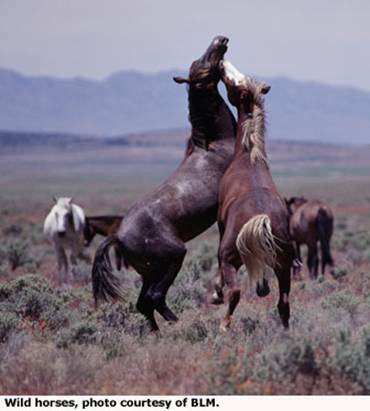 The Science Conservation Center in Montana, meanwhile, has written a rebuttal to the Audubon Society, saying that contraception would be better than killing to control the number of wild horses. But BLM itself, The Times reported, stands accused of having little interest in contraception. For BLM substitute National Park Service; they’re both agencies of the Interior Department. For Audubon Society, substitute Marin Group of the Sierra Club; they’re both for the birds. For the Science Conservation Center, substitute the Humane Society of the US; they both oppose the Bush Administration’s applying to wildlife its “Just Say No” antipathy toward contraception. And for wild horses, substitute white deer; nativists dislike both animals for supposedly being non-native, even though they’ve been in North America for centuries. Just how long has each species been in North America? 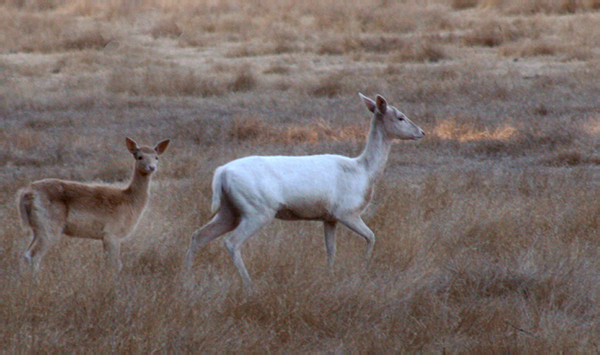 George Washington released this country’s first white deer on his farm at Mount Vernon. Unfortunately, the Pacific West Region of the National Park Service appears to dismiss our first president as some distant, benighted fellow. As for the horse, it “began evolving on the North American continent 55 million years ago, before crossing the Bering land bridge and spreading through Asia and Europe,” the June 28 Economist reported. BLM says there’s not enough forage for 33,000 wild horses on their 29 million-acre range and wants to kill 6,000 of them. Claiming there wasn’t enough forage for 1,000 exotic deer in their 75,000-acre range, the Park Service last year shot roughly 800 of them. 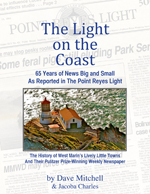 Last week, the Park Service said it will soon shoot the rest. I’m surprised by how frequently West Marin residents say one reason they hope Obama wins is that it would allow the Democrats to clean house in the Department of the Interior. Blood-lust, defiance, and vengeance have come to epitomize the department’s land-use management. These are not traits most of the public will tolerate forever. With National Seashore Supt. Don Neubacher saying to hell with members of Congress, the lieutenant governor, and most West Marin residents, he’s going to kill deer, a peaceful protest is scheduled for 1 p.m. Sunday. Demonstrations will gather at the Sacred Heart Church parking lot in Olema and walk a quarter mile north along Bear Valley Road. Sparsely Sage and Timely is powered by	WordPress 4.9.10 and delivered to you in 0.329 seconds using 50 queries.